This week I met the CEO of a large company that’s taking on a highly controversial project. Despite the potential for public backlash and reputational harm, this CEO has sound reasons for getting his company involved. Through speaking with him off-the-record, I was able to grasp those reasons too. Whether I agree with those reasons is irrelevant. What’s important is that I understand why the CEO is taking this position, and that allows me to see the other side of this issue more clearly. Now I can present both sides well, should I ever be asked to report on this. In other words, by going off-the-record with me the CEO ensured that my reporting will be better-informed. Going off-the-record with journalists is routine practice. There’s something in it for everyone. But before you go off-the-record with the nearest reporter, STOP. There are some key things you need to know. What does talking to a journalist “off-the-record” actually mean? “Off-the-record” is interchangeable with other phrases such as “for background only”, “not for attribution” and “Chatham House rule”. They all mean the same thing, essentially. AND THEN THEY DON’T. See below. When journalists are learning their craft, no one teaches them a set meaning for “off-the-record” and all those other phrases. Each journalist just figures it out for themselves as they go along in their career. Crazy I know, but true. 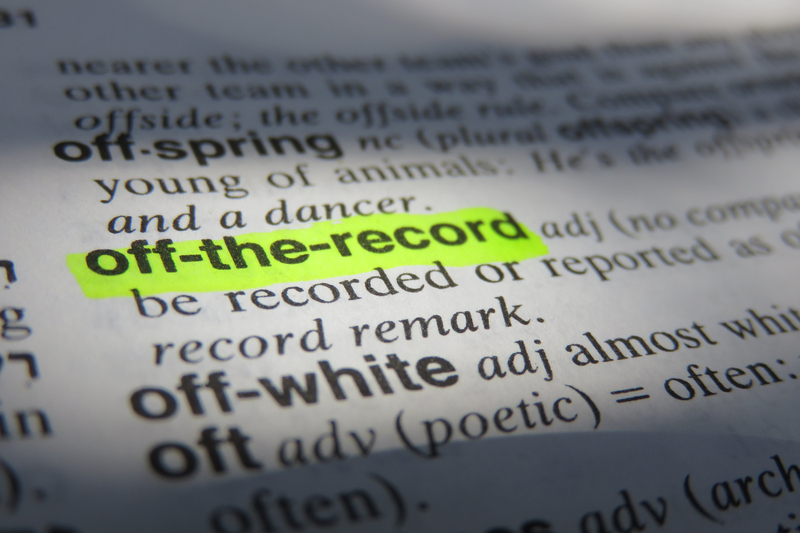 So if you’re planning to speak off-the-record, set your own rules for what “off-the-record” means to you, and make sure the journalist understands your definition. · Do I want this entire conversation to be off-the-record, or just some of it? Tell the journalist which bits. · Am I happy for the journalist to quote me, but keep my description vague? Can they mention my workplace or perhaps call me something like “a source close to the issue”? · Rather than quote me, do I want the journalist to paraphrase me instead, and still keep my description vague? · Or, is there a specific descriptor that I want the journalist to use, like “industry insider”? · Alternatively, do I want the information I provide kept out of the story entirely, and only used by the journalist to better understand the issue and inform/influence the questions they ask others? · Can the journalist ask questions of another person that could possibly unmask me as their source? If so, how do I want them to phrase those questions? You can’t go off-the-record after the fact, so don’t even try. Everything you say to a journalist is considered on-the-record unless you stipulate the conditions beforehand. If you have a Communications/Publicity person, this is the person who should set the rules with the journalist prior to the interview. If you handle your own media interviews, then you need to do it. What’s key here is the issue of trust. The journalist trusts that you’re giving her accurate information that simply can’t go on-the-record, and you trust that she’ll abide by your conditions. Therefore, only go off the record with someone that you have reason to trust. Well, a couple actually. Firstly, just because you go off-the-record don’t expect favourable treatment from the journalist. You’ll be treated fairly in any story they produce, but not favourably. Secondly, just because you’re talking off-the-record, don’t go shooting your mouth off about anything and everything. Say what you wanted to say, and stop. And lastly, remember the golden rule in journalism: is there an overriding public interest to publish? If what you tell a journalist is too important to keep quiet, they may decide to publish what you’ve said, and the fact that you’ve said it, citing overriding public interest. It’s rare, but it can happen. OK, consider yourself briefed. Now go find a journalist you trust and help them understand your perspective. You’ll be doing both of you a favour.